CWI Endorsement Training Preparation Course for ASME VIII (Rules for Construction of Pressure Vessels) and ASME IX ( Welding Qualification) is video training course and is 40 hours (5 days) course and available online all over the world. Hi, this is Bob Rasooli from I4I Academy. There is no powerpoint presentation with a voice-over in this course. I know most people do not like online courses or do not see as effective as a real classroom course; that is why I am using video training and editing videos to simulate the actual classes for my students. Each course comes with a handout which you need to review them while/or after watching the videos. You are going to take a final exam at the end of the CWI endorsement training course and receive a certificate from I4I Academy with my signature. 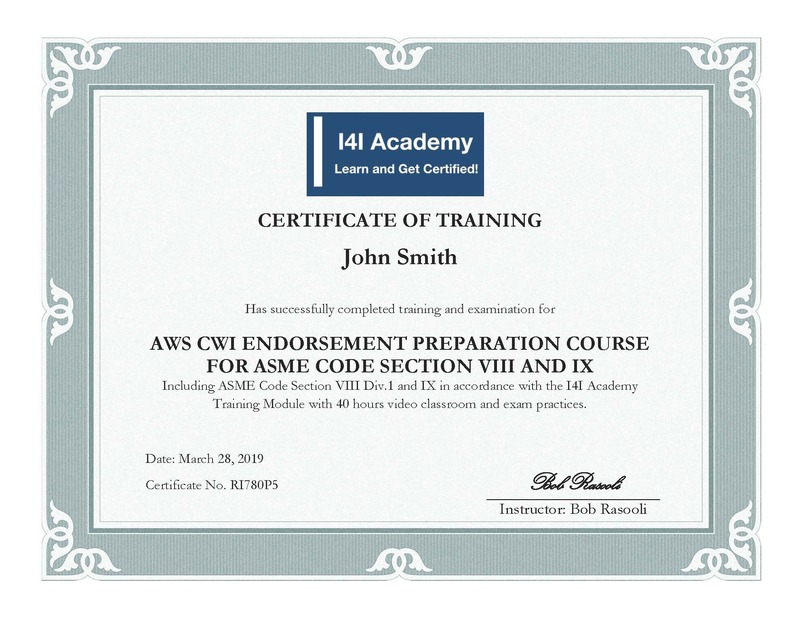 This course will be prepared you to take AWS CWI Endorsement exam, or if you are a first-time CWI exam taker, you can use this preparation course for your Part C exam. *If you need help during the study, the support will be available! Risk-Free: You can return this training course up to 48 hours from the time of payment. Qualified Positions, Pipe diameter, Wall Thickness, etc.